If your company is considering reassigning your development team to write AWS automation scripts – stop. Although AWS automation scripts to turn instances off when not needed can reduce cloud computing costs, there are more cost-effective solutions you could implement rather than engage your development team in non-core activities. Reassigning developers to write scripts for automating AWS is expensive. It also delays the completion of other projects. In fact, depending on the size of your company and the variety of instances deployed on AWS, it could cost more to write scripts for automating AWS than you save. “Cloud awareness” is a term that describes the three stages that companies often go through when they start using cloud computing services. The first stage is the adoption of cloud computing services to take advantage of cost savings, flexibility and scalability. As the benefits of cloud computing are realized, companies expand their use of the service. This is the second stage. The third stage comes when companies realize they are spending more than they need on cloud computing services and implement measures to optimize their costs. It is a progression that was seen when data centers first started, and we are seeing it again with cloud computing. However, whereas writing scripts for automating AWS might reduce cloud computing costs, it is often the wrong way to react to stage three of the cloud awareness journey. A more versatile and cost-effective solution to optimizing cloud computing costs is AWS scheduling software. AWS scheduling software keeps the cost of deploying development, testing, and staging instances under control by enabling users to schedule on/off times with a few clicks of a mouse. The software also provides a single view dashboard to display all a company´s resources from multiple AWS accounts, across all regions, instance types and pricing options. Administrators can then use this information to create permission tiers that give development teams access to just their instances. Once permission tiers have been created, development teams can create their own schedules without affecting the schedule settings of any other teams – a far better solution than writing multiple AWS automation scripts for multiple AWS accounts, across multiple regions and pricing options. AWS scheduling software works via a lightweight SaaS app that users log into using their IAM role or user credentials. Once logged in, the app locates the instances assigned to that AWS account and makes recommendations about which are suitable for scheduling based on their names and tags. Users select which of the recommended instances they want to schedule, and then either assign a pre-configured series of on/off times (for example on during weekdays from 9:00am to 7:00pm) or create a schedule of their own by highlighting the times they want to switch instances off via an intuitive grid. Once the schedules have been set, the projected savings over the next thirty days are calculated and displayed on screen. The schedules can be adjusted as necessary by the user, or “snoozed” if access to the instances is required while they are scheduled to be switched off. AWS scheduling software enables you to optimize cloud computing costs the easy way. Based on the pre-configured schedule mentioned above, a company would save more than 70% on the cost of deploying development, testing, and staging instances on AWS – without the cost of having developers write AWS automation scripts. The savings can be quite significant. Among clients that have used ParkMyCloud´s AWS scheduling software, the global audio and video technology company – Avid – has reduced its annual AWS spend by $55,000, while the largest privately-owned health services provider in Australia – the Tristar Medical Group – saves up to $240,000 per year by automating on/off times for its non-production instances. How Much Could You Save Automating On/Off Times for AWS Instances? If your company is considering reassigning developers to write AWS automation scripts – or has already reacted to the third stage of the cloud awareness journey – we invite you to try ParkMyCloud free for thirty days. Our offer gives your company the opportunity to evaluate our AWS scheduling software in your own environment, so that you can see how easy it is to optimize cloud computing costs with a few clicks of a mouse. There are no credit cards required in order to take advantage of our invitation, no contracts to sign or commitment to continue using ParkMyCloud to optimize cloud computing costs once your free trial is over. Sign up today to try ParkMyCloud for free, or contact us for further information about why ParkMyCloud is a more cost-effective solution for optimizing AWS costs than reassigning your development team from core activities. There are more cost-effective ways to reduce cloud computing costs than AWS automation scripts. 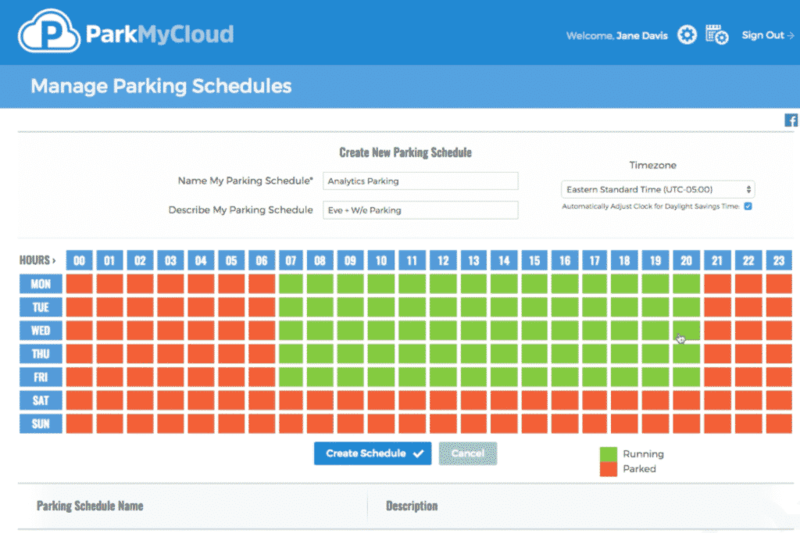 ParkMyCloud automates on/off times for non-production instances with a few clicks of a mouse. Our single-view dashboard increases governance of your accounts and helps enforce accountability. You could save more than 70% on the cost of deploying non-production instances on AWS. Try ParkMyCloud today for free. Whatever you save by automating on/off times is yours to keep!